On the southwestern coast of France, particularly in the Charente-Maritime department, there exists a very special dish: éclade de moules, or mussels cooked under pine needles. The dish originated with local mussel fishermen who landed their boats on beaches fringed by pine forests. To cook their mussels, they’d bury them in a mound of dry pine needles and set the whole thing alight. But this wasn’t simply a practical way of cooking mussels using available resources. The fishermen also found that the pine needles imparted a unique smoky flavor to the mollusks, a sensational taste that soon took éclade de moules beyond the fishing community to become a campfire favorite in this part of France. Éclade de moules can be prepared in a variety of ways, but all involve embedding them below or within a mound of dry pine needles. Chefs arrange the mussels hinge-side up so that ash doesn’t fall too freely into the shells. More traditionally, they are placed on a wooden board with four nails hammered into its center. The first mussels are propped up against these nails, and from there the rest are carefully placed in concentric circles, supporting one another. Once in place, the mussels are covered with a thick layer of pine needles. Then the whole thing is set alight and, if necessary, fanned using a piece of cardboard to spread the flames evenly. 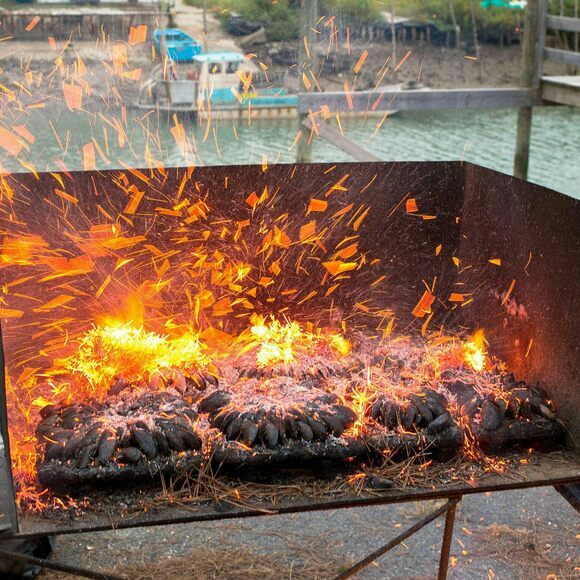 The intense heat steams the mussels in their own liquid, and as they begin to open they take on more of the pine-flavored smokiness of the fire. When the smoked mollusks are ready, chefs simply fan away the ash and serve, ideally with bread, butter, and a glass or two of French white wine. This restaurant is located on Île de Ré, an island famous for its mussels.